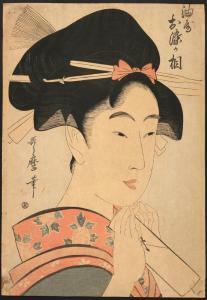 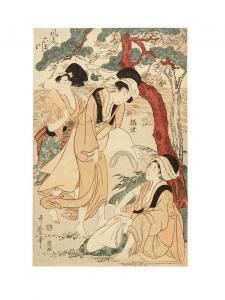 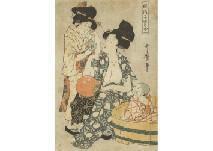 Find artworks, auction results, sale prices and pictures of Kitagawa Utamaro at auctions worldwide. 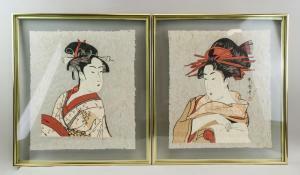 Elegant Comparisons of Little Treasures (Furyu ko-dakara awase) KITAGAWA Utamaro (a set of 4) woodcut, frame window size 36.5x25cm, signed on plate, this lot accompanies other works; UTAGAWA Sadahide【Toto Takanawa Fukei (triptych)】(woodcut, each frame window size 35.3x23.3cm, signed on plate, with publisher's seal, with censor's seal "Aratame"and a seal of date) The 2nd generation UTAGAWA Kuniteru【The Takanawa Steam Railway (triptych)】(1870, woodcut, each frame window size 33.7x23.8cm, signed on plate, with publisher's seal, with censor's seal "Aratame"and a seal of date)【Sumo-e (heptaptych; seven parts)】(woodcut, frame window size 35x167cm, signed on plate), all framed. 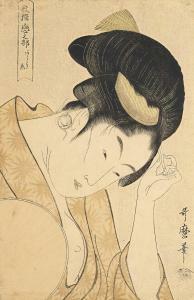 * *Not examined out of frame.